When she first experimented with composting, Vani failed. 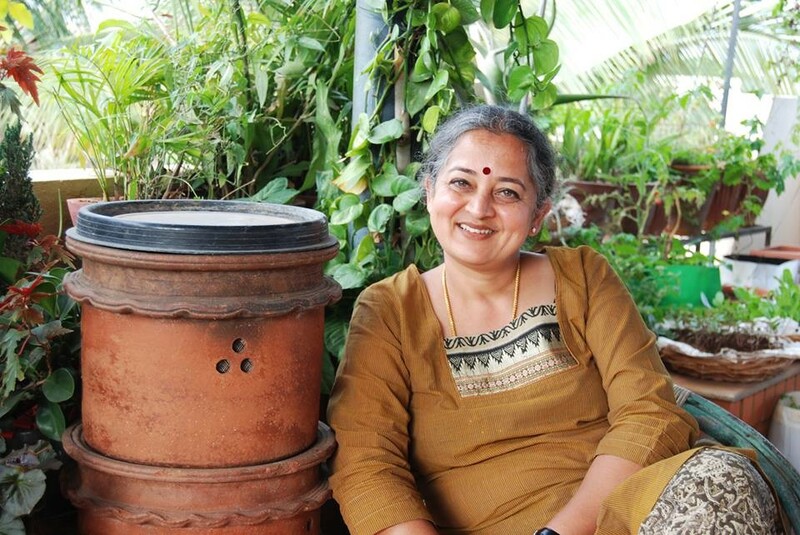 Today she’s regarded as one of the leading urban composting experts in Bengaluru. She has practised and taught several methods. Her apartment is a laboratory of sorts where she has four different methods of composting running in parallel. It has become a great open source of information and has people flocking it each time she holds a composting workshop. In fact, there have been more than a few who have walked out of the workshop fully transformed—from being a cowdung-hater to a compost-lover. Let’s explore the home composting methods she has perfected for over five years. Urban composting is the simplest solution for managing an individual unit’s wet waste and there are different methods to choose from, all of which are simple and effective. “Composting in simple words is the breakdown of organic matter, it happens naturally in open spaces. However, in the urban setting, lack of space requires us to practice this in a contained atmosphere. This requires a certain amount of understanding as we are creating conditions suitable for breakdown in the contained atmosphere. Often, bad smell, rodents and insects are the primary issues that people face due to lack of understanding,” says Vani. 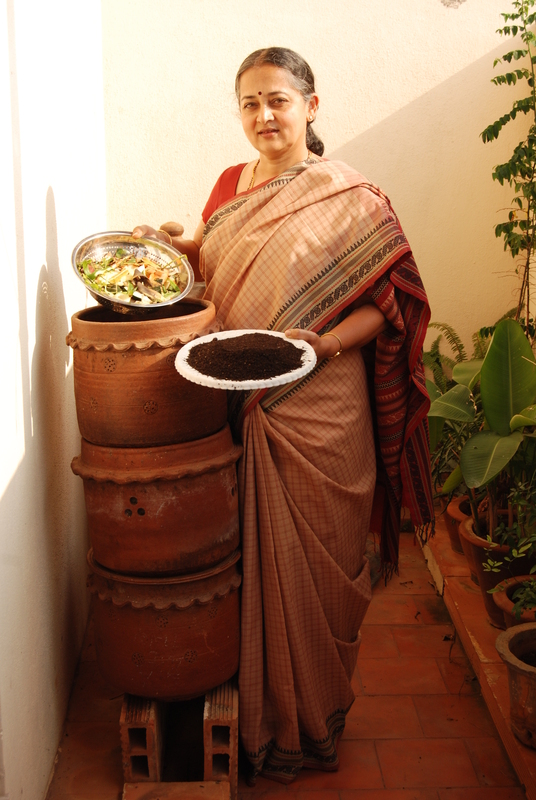 Vani Murthy uses Khamba, among other containers, to compost her kitchen waste at her home. Aerobic, as the name goes, involves air circulation for the breakdown of organic matter. It requires very little in terms of infrastructure. If you choose not to invest in a Khamba from Daily Dump, you can start with any container. But make sure you punch some small holes around it to ensure circulation. Vani has been practising with both Khamba and other containers for years. What you need: A Khamba or a pot or a tub or any container with small holes for aeration, dry leaves and an inoculum which is nothing but a rich concentration of micro-organisms to speed up the composting process. Collect all the organic waste from your kitchen and mix it with an equal quantity of dry leaves. Either add half-done compost/buttermilk/cow dung/Panchagavya to start the process. The pile must be turned once in four days. Keep the container covered; not airtight though. Once full, it will take 30-45 days to break down. Sieve it and use the finer part. The rest can go back into the container for further breakdown. Collect all the organic waste from your kitchen and mix it with dry leaves of equal quantity. Crush the dry leaves for faster and easier breakdown. Either add half-done compost or butter milk or cow dung or Panchagavya to start the process. If the pile is too wet then it will start to stink. Add more dry leaves to neutralize it and aerate it. If it’s too dry, the breakdown will stop. Sprinkle some water. Once full, it will take 30-45 days to become compost. It is advisable to avoid adding meat, dairy products and cooked food at least in the beginning. Keep the container covered, but not airtight. Daily Dump sells the Khamba which comes with detailed instructions. This entry was posted in Endlessly Green, Home composting and tagged Aerobic composting, aerobic Khamba composting at home, Container composting, home composting methods, Khamba composting by Vani Murthy, Shyamala Suresh, Vani Murthy. Bookmark the permalink. ← My own home composting experiment, my own little triumph! I am looking for translators to take this and other community composting methods to a greater audience. It’s a most useful way to turn our kitchen waste into a compost to make our kitchen garden least expensive and more productive. I am very much impressed and like to attend the the next workshop. I live in Mangaluru and it’s very interesting to note such an easy method to composting. 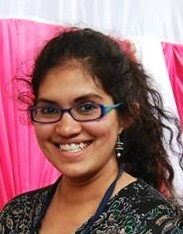 Can we have a composting workshop in Mangaluru by Vani Murthy? Does she travel? Thank you. Nice to know about your composting interests. I guess platform composting would be the best for dry leaves. But I am not sure if you have ample supply of cow/buffalo dung. If yes, then please read about this method in the community composting category. I started composting 1 week back but now I see small worms in my bin.Do I need to discard the whole thing or can I let it continue? can I add shredded paper with dried leaves (both are carbon).